A symphony of ultra-modern beauty and classical warmth, this brand new home offers lock-up-and-go convenience with luxurious dimensions. Attractive, easy to maintain garden with established trees and an inviting plunge pool. Beautiful receptions flowing outdoors include a main lounge, informal lounge and open plan dining room. The stunning kitchen offers sleek counter tops, a central island with a prep bowl, Smeg gas stove and oven, plus a separate scullery / laundry. The four upstairs bedrooms overlook the garden, magnificent mauve mountain views and emerald green pine trees. A fifth bedroom / guest suite has glass sliders to a lovely garden area. The exceptionally well maintained park next door offers wonderful extra space to enjoy, with jungle gyms for children to play on. Sophisticated security will give you peace of mind and double garaging, ample paved parking, staff accommodation plus a borehole, will add to the convenience of living in this superbly fitted and finished home. Magnificent surroundings, gorgeous green belt strolls / cycles and wine estates with signature eateries, including Constantia Uitsig restaurant and bike track, Groot Constantia, Beau Constantia, Buitenverwachting, Klein Constantia, Steenberg and Eagles Nest plus the ability to take scenic drives to nearby beaches will allow you to enjoy the Constantia lifestyle to the fullest. 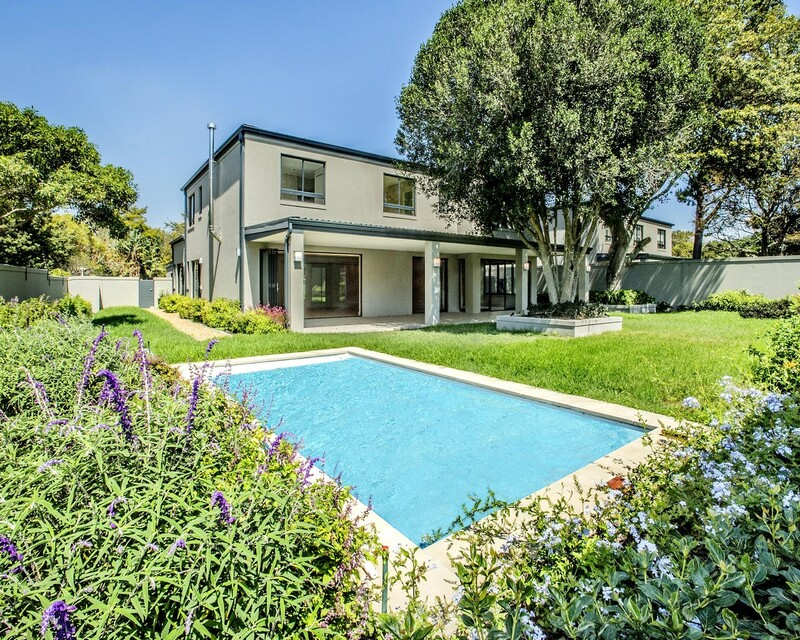 This home is centrally located with easy access to the CBD; Cape Town International Airport; both Constantia Village and Steenberg Village Shopping Centres, Cavendish and Blue Route Shopping Malls; Virgin Active Gym and Constantia sports grounds. Sophisticated security system, shared borehole plus separate storage tank.